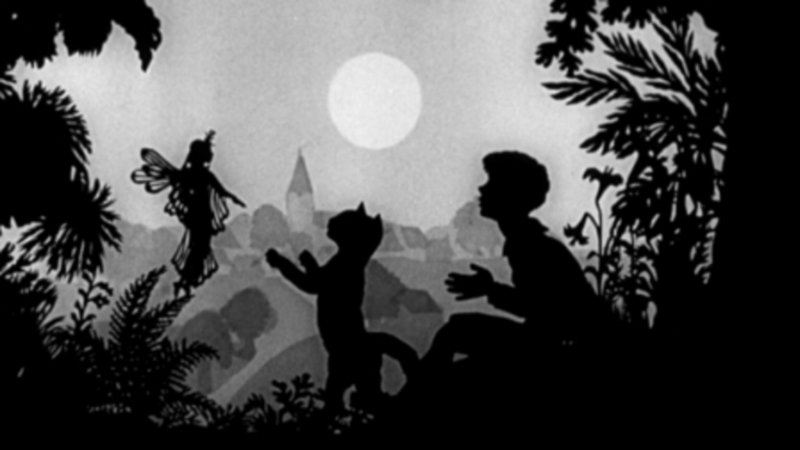 Saturday 9th June saw the return of the Children’s Film Club to Birkbeck Cinema with a special presentation of six fairytale animations from German film-maker Lotte Reiniger, hosted and presented by Esther Leslie. Screened were Puss in Boots (1954), Aladdin and the Magic Lamp (1954), Cinderella (1954), The Sleeping Beauty (1954), Hansel and Gretel (1955) and Jack and The Beanstalk (1956). The last of these was the only film made in colour (however the colour only stretches as far as background paintings, Reiniger’s familiar silhouetted characters remaining steadfastly black and shadowy). As Esther Leslie explained, the films were chosen specifically to offer the easiest and most familiar introduction to Reiniger for the young viewers in the audience, and there were also no complaints from the many adults who were in attendance and taking the opportunity to catch the rare treat of cinematic screenings of Reiniger’s exquisite, delicate animations. Forming part of the distinct middle of Reiniger’s long career, which stretched from the silent era (where she created the original versions of several fairytales recreated in her later years here, and produced the oldest surviving feature-length animated film The Adventures of Prince Achmed) to the early 1980s, these short works were made for transmission on British and American television and, as such, feature English-language narrations and tellings of the stories familiar to Anglophone audiences. In the present-day there is perhaps something even more enchanting about Reiniger’s style than ever before, her style both stark and yet intensely detailed, the rich particulars of her silhouette’s dress enough to create an impression of opulence, of timeless and pan-European mythic history. The pace, for all the minimal length of the shorts, is deliberate, entirely sure and certain; simplicity is allowed to make a case for itself, ambiguity is permitted to lurk at the edges of the frame and in the small, flickering movements of her silhouettes. Almost entirely absent is the hyperactive pace of most contemporary children’s animated films, the crude and often-clumsy fusing of internet meme allusions and pop culture references to the high strangeness and un-real realness of ancient story-telling. The children in the audience were spellbound.